Velociraptors we now know had feathers, but it so far no model versions show them. This feathered "Jurassic Park" Velociraptor (based on raptor Deinonychus, and not really a Velociraptor) has been created by feathering a 1993 plastic Kenner Jurassic Park Model. This one fortunately has lost it's annoying voice. The techniques can be used to feather any size of velociraptor or other dinosaur you want, just adjust your feathers and techniques to suit the size of your model. The model can be feathered with any combination of feathers you can find. We have no idea yet what color these animals were. For safety, please use fly tying feathers which have been cleaned and treated. Feathers from pet birds or feathers you find in the wild can carry a number of nasty creatures and diseases. To begin, read the Tips on Working with Feathers which will explain how some of the feathers are shaped and glued. Read through all the steps that follow before you rush off to buy a plastic model or feathers. It will save you time in the long run. As I mentioned before, the best source of feathers for model projects like this velociraptor is a fly fishing supply store. Do not use found feathers, as they can carry pests and diseases. When looking for feathers, choose ones with fine thin shafts or quills (the center of a feather). Fine feathers with delicate shafts or quills will be much easier to bend and place when trying to cover a model or miniature. The length and size of the feathers is not important as they can be trimmed. Do try to avoid feathers with stiff curved quills however as they will be difficult to set on curves. I decided to go with the bright colors suggested by the original model, and my possible stash included white feathers from the neck of an India hen for the underwing, I also used orange colored teal flank feathers and natural teal flank feathers to add the barred feather contrast, along with a single goose biot, the leading edge of a goose wing feather for the velociraptor's crest. It takes very small amounts of feathers to cover a toy or model. A package of biots, a package of colored teal lank feathers and one of natural feathers will probably cover at least two model dinosaurs. Good reason to work with a friend! To make sure your feathers blend as easily as possible into the paint on your velociraptor, run a test by laying a few feathers over the surface to see if the painted layers show through. If not, you will have to undercoat your dinosaur to change the color so it blends in better with your feathers. The feathers shown here work well with the existing paint colors, so the model can be left as is without an undercoat or base coat. If you do need to change the color to suit your feather choice, modelmaster acryl by Testor works well as a base coat over plastic and paints. To help the feathers stick to your model, first give it a thorough cleaning with either soap and water, alcohol, or Winsor & Newton Brush Cleaner And Restorer. You may also want to test your chosen glue on a hidden part of your model to make sure the glue will not eat or damage the plastic your model is made of. I used a tacky craft PVA (white) glue which worked well with the stiff plastic my model is made from. If your model has a very shiny surface, you may want to roughen it up slightly with a fine sandpaper (600 grit or above) to give the glue something to hold on to. If your model does not have flaking or peeling paint, a wash with rubbing alcohol or alcohol based hand sanitizer (not one with lotion) will work well. Use a cotton bud or a cloth moistened with the alcohol and work it into all the surface areas where you want to apply feathers. Rinse of thoroughly with water and allow to dry. Before you begin to cover your dinosaur, sort your feathers into groups according to color, size and pattern. You want to be able to reach for heavy patterns when you need them, and non patterned feathers for the places the color would be less noticeable. The first step in feathering your velociraptor is to start at the base of the thigh. I set my feathers so they would just cover the 'knee' of my model with the quill end facing up. Using the information on adding glue to feathers, put a thin line of glue down the back of your feather along the spine and set them in a neat row across the dinosaur's thigh. Add in larger feathers as you move up the thigh, ending with the feathers you want to 'top coat' the dinosaur's thigh. For my dinosaur this top coat was a layer of orange teal flank feathers. Don't worry about how neat or finished the feather application is you can trim it to shape when everything is dry. Do take care not to apply too much glue, and keep your feathers in neat layers. With the base coat of the under feathers on the thigh, you can move around to placing the feathers on the velociraptor's belly. In this case, the quill end of the feather should face up or off to the outer side similar to the way the thigh feathers were placed. Direction of feather placement is very important to the shape and finish of the final coat. Select feathers which cover the velociraptor's belly neatly, trimming the feathers to shape to utilize patterns or remove thick portions of a quill. If the legs or arms on your model move, make sure they can move freely once feathers are applied, or adjust the position of the feathers before the glue dries. 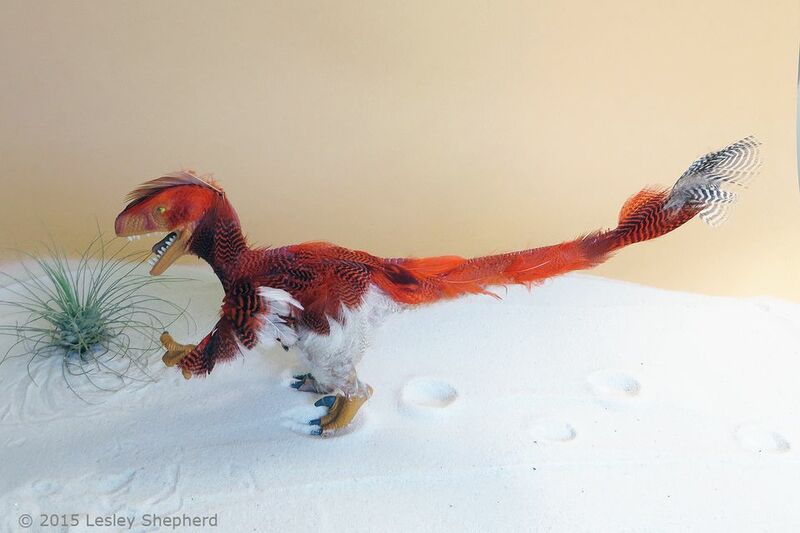 In the photo on this page you can see how scraps of the barbs on the base of feathers trimmed to fit the belly, were used as 'flocking' to give a fine downy undercoat to the velociraptor's tail. See this page for how to make the feather flock. As feather flocking does not have quills, you need to carefully apply a layer of glue where you want to add the flocking, the gently press your feather flock into the glue. If possible, try to set the barbs in the same direction (facing along the side to the back of the tail). Like the other parts of the velociraptor, you need to add feathers at the base of each body part before you connect to the next part. Once you have flocked the underside of your velociraptor's tail, add a clump of wide tail feathers to the base of the tail if you wish. If you prefer to avoid the wide flashing tail display, just cover the end of the tail with feathers. I chose some highly patterned natural teal flank feathers for the end of my dinosaur tail. I then added in a few orange colored teal feathers with a distinctive pattern to widen out the display. Once you have the end tail feathers in place, decide how you want to finish the top and sides of your velociraptor's tail. I chose some of the plain orange teal flank feathers I found in my feather sorting, to cover the tail sides. I alternated plain orange and patterned orange feathers along the top of the velociraptor tail. I took two plain trimmed orange teal flank feathers to cover the head of my velociraptor. I wanted to leave the edges of the mouth visible like a beak, but to put feathers around the eye and a bit down the face. If you can't find feathers with a suitable curve or fine enough quills, this is another good place to use feather flocking. Notice how the tail sides and top are now mostly feathered. As I get up over the top of the dinosaur's thigh, I added some heavily barred (striped) feathers to the dinosaurs back, covering the top of the thighs. Think carefully about how far down the thighs you want to have patterned feathers. You should apply them to the lowest levels of the thigh first and work your way back up in layers. I decided I wanted my velociraptor to have a small crest on the top of its head. To make this crest I held a goose biot (a special section of a goose wing feather available from fly tying shops) along the top of the velociraptor's head to find a good curved section for the crest. I then trimmed this from the main feather. You could trim a crest from a regular feather by cutting back the feather barbs on one site of the quill to shape the feather into more of a crest. To glue the crest to the top of the velociraptor's head, run a bead of glue along the side of the feather with the shortest barbs. Set the feather onto the center of the velociraptors head in the position you want your crest. You can set it so the barbs are facing forward (as shown) or back. Hold the crest feather in place until the glue begins to grab, then set the velociraptor aside for the feathers to dry. In the photo on this page you can see how the body feathers now cover the body up to the arms and neck. The feathers are still rough and will need a final trim when the dinosaur is completely feathered. To begin to shape the wings, trim your chosen feathers to resemble flight feathers at the base of the wing. Start laying the feathers along the velociraptor's 'arm' working from the body side out to the claws. If your velociraptor has moveable limbs, check that the feathers will not interfere with the movement. When you have laid in a complete line of trimmed 'flight' type feathers on the velociraptor's wing, lay a longer feather across from the outer edge of the wing towards the body, covering the top of the wing quills. Allow this lower wing to dry completely before you add the final top wing feathers as this structure has very little support. The final stages in finishing the velociraptor are to add the upper covering wing feathers. I chose to use heavily patterned feathers for this. Begin on the body side and move out to the end of the wing / arm. To finish the inside edge of the wing and cover the plastic arm sections, use trimmed downy bits from the base of your chosen feathers. Glue these on the inside edge of the arm, covering the arm and the quill edges of the feathers on the top outer surface of the wing. Now sit back and assess your dinosaur. Feathers which are out of place can be trimmed with sharp scissors, just try to keep the trimmed shapes natural and not too square. If you need to cover spots where you can see through to the plastic body below, add more feathers or use bits of feather flocking. When I reached this stage I decided to flock below the knees of my dinosaur for a look that better resembled a bird. Have fun. Your velociraptor will need to be stored carefully in a dust free place to keep the feathers looking fresh. You can make a simple diorama with some sand an an appropriate box. For my model, a simple display box made from a photo storage box cut so the top makes a frame would work well. I would turn it on it's side and add sand or a sandpaper base to make a ground for my newly feathered velociraptor.